It’s been a few months since I decided to let go of some stuff to make space, and my closets (and slate?) remain clean. However: I gained back 16 pounds of the 25 I lost last year (argh), and my stress levels have been through the roof. 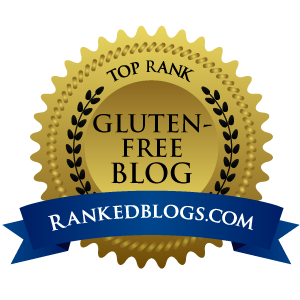 A couple weeks ago, I started up round two of cleaning up my act, this time focusing on diet and stress management. 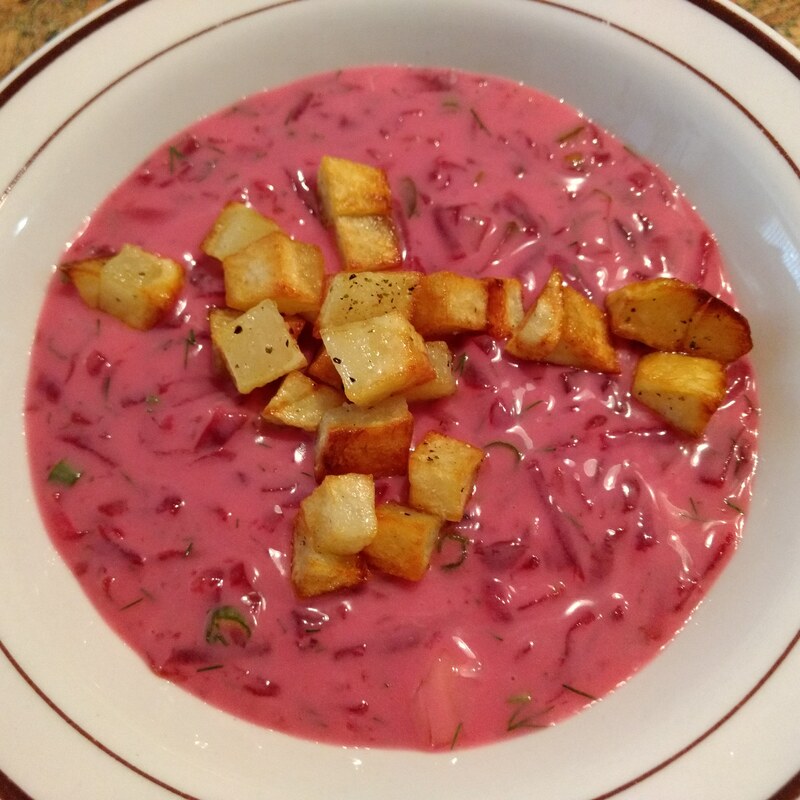 Lithuanian Saltibarsciai is a cold beet soup traditionally made with kefir. I made this non-dairy with coconut yogurt and rice milk. It’s delightful. I learned last year from the Whole 30 that I am sensitive to dairy. But, I’ve been eating it anyway, and over the summer, I just pretty much went for it. That, and I was drinking alcohol almost every day. All that cheese and cider really adds up in terms of calories, so even though I was still exercising 3-4 times a week, the weight crept on. One of the things I love but haven’t been able to do lately is hiking. With my neck all messed up, I haven’t been up for carrying a pack or being too far from home. I’m going to get back at it this weekend, hopefully, and perhaps regain a little sanity out in nature. So in place of that, I’ve been doing lots of creating at home. This has mainly been focused in two areas: cooking and fixing up furniture. 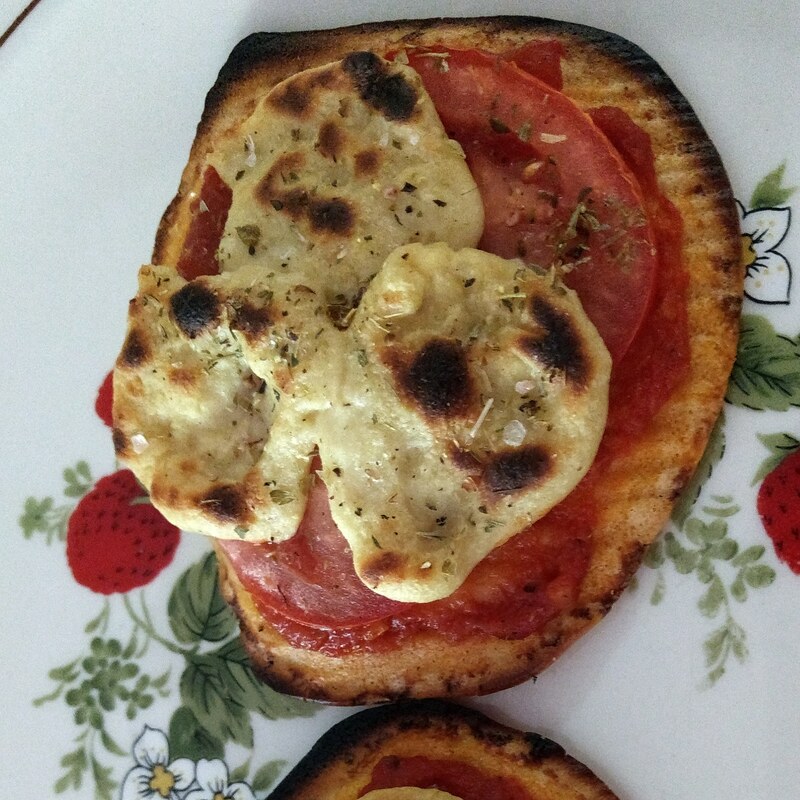 My experiment in faux mozzarella looked pretty good! Since giving up dairy, I find myself slightly obsessed with cheese-like substitutes. I have tried Daiya and its ilk, but it tastes weird and doesn’t melt right. So now, I’ve been dabbling in making cheese-like things from cashews and nutritional yeast, with mixed results. Anything made from cauliflower is a lie, FYI. I did like this Easy Vegan Mozzarella Cheese from Minimalist Baker, and I made a decent nacho cheese sauce from potatoes. So now I’m doing things like soaking raw cashews and going through loads of nutritional yeast, and wondering why no one can make fake cheese that melts. My other new hobby is taking sturdy but cosmetically unattractive furniture and making it pretty again. With instruction from my mom (shout out to Gluten Free Grandma T, who is actually Dairy Free Grandma T now) and a little assembly assist from my stepdad, I’ve finished two things and have another two in progress. 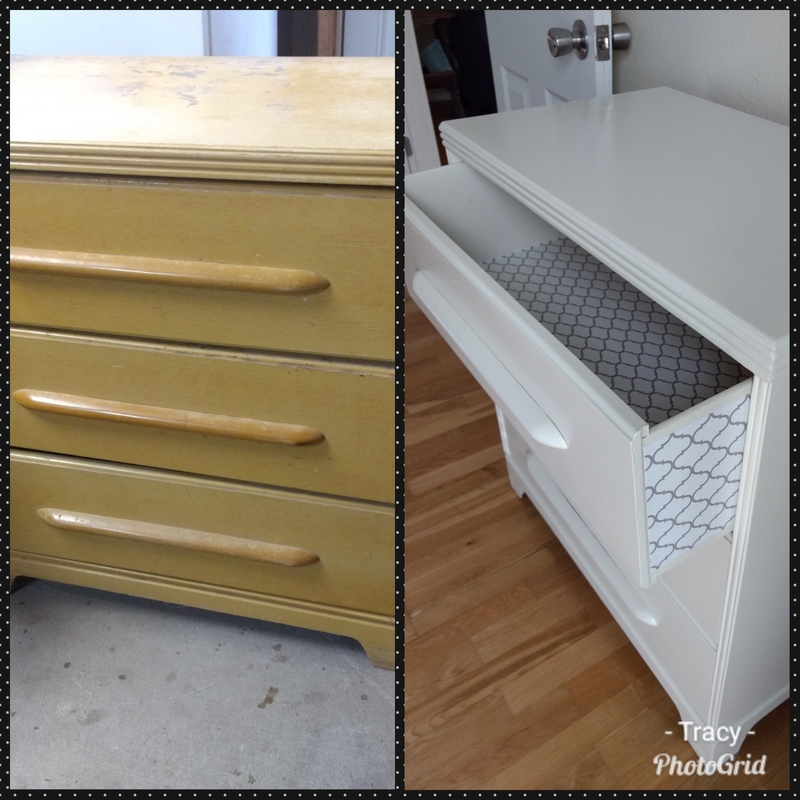 The first project was to beautify a free dresser I acquired. It was kind of an ugly yellow wood, and was pretty dirty and beat up when I got it. The insides of the drawers had kid drawings in pen, and there was some kind of rodent poo in the bottom. Lovely. So, we cleaned it up and my mom taught me how to sand. She also glued the top of the dresser back down (yay.). I then painted the whole thing white. Finally, I lined the drawer bottoms and the outside of the drawer sides with contact paper. It looks so clean, I love it! The second project was to build a small bookshelf out of two wooden crates I found on my street (with a “free” sign on them!) My stepdad put a piece of wood between the two crates, and attached legs with more wood at the bottom. The wood was scraps in the garage, and the legs came from an old desk they had. He assembled the whole thing for me. 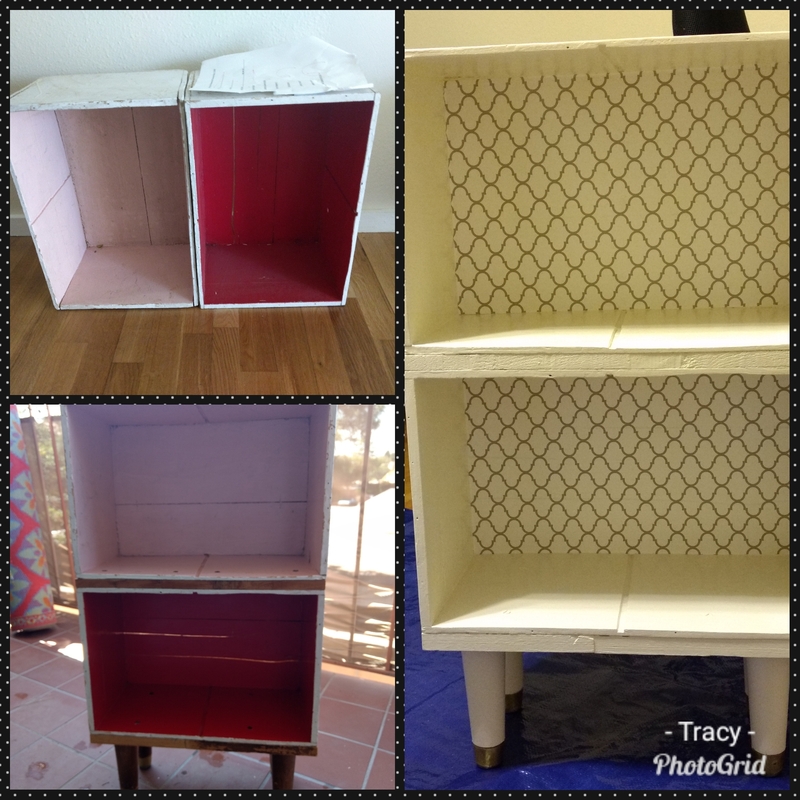 Before, during and after – two wooden crates become a little bookshelf. All in all, I’m really happy with both of those projects and they look nice in my guest room. My next two projects-in-progress are an end table with a veneer top that I am in way over my head with, and another little end table with a drawer that started out bright blue but will eventually be gray with a contact paper drawer. What do you do to deal with stress? I even stress clean, though lately I haven’t had the urge! Have you ever given a piece of furniture a makeover? Tell me in the comments!